Landslides triggered by severe flooding in Chile capital, Santiago, have contaminated a major river, leaving an estimated 4 – 6 million people without drinking water. The water supply from the Maipo river has been cut off until further notice, said emergency authorities. “We are talking about 1.45 million homes that are going to be affected by the cutting off of the water supply, which will be total or partial in 30 districts,” said the intendant of Santiago Metropolitan Region, Claudio Benjamín Orrego Larraín. Climatic analysis and forecasts are available from FIRE-EARTH PULSARS. Wildfires threaten vineyards and wineries in Colchagua Valley, which have been placed on red alert. The worst affected areas are Malloa, Marchigüe, Palmilla, Peralillo, Pumanque, Rengo and Santa Cruz. More than a dozen blazes have spread across over 135,000 of hectares, according to local news. Fire is spreading at a speeds of up to 4,200 meters per hour. Smoke and ash are affecting the Chilean capital and largest city, Santiago. Additional details are available from FIRE-EARTH PULSARS. An estimated 4 million people without drinking water, as torrential rains triggered severe flooding and major landslides and rivers breached their banks, polluting the drinking water in the capital Santiago, according to reports. More than four million Chileans are without drinking water, with seven million in the capital under threat, as tap water production falls to 35 percent of normal, the report said. Extreme rain events have plagued central parts of South America, causing severe flooding in Uruguay, and prompting the authorities to declare a state of emergency. Widespread devastation and multiple fatalities have been reported across the Andean country, with thousands of people left homeless. At least one tornado has left four people dead in the town of Delores, 250km northwest of the capital, Montevideo. Up to 190mm of rainfall in 24 hours has been reported in central Uruguay. Chilean officials have declared an environmental emergency in response to PM2.5-rich smog in the capital, Santiago. The emergency measures requires about 3,000 factories and other polluting businesses to stay closed on Monday. Additionally, 40 percent of the capital’s 1.8 million cars will stay off the roads, said Santiago regional governor Orrego Larrain. “We’re currently facing unusual conditions, with one of the driest Junes in over 40 years as well as really bad air circulation conditions over the Santiago valley in recent days, which boosts the concentration of contamination,” said the Environment Ministry. The restrictions would remain in place for 24 hours, while dangerously high pollution levels persists, but can be extended if no improvement in the conditions results. Meanwhile, the health officials have urged Santiago residents to avoid outdoor exercise, while the emergency measures last. Santiago [metro population: ~ 7.5 million] is located in Chile’s central valley, at an elevation of 520 m (1,706 ft) above the sea level. The quake follows an earlier strong shock that occurred at 35.413°S, 72.368°W on October 30, 2013. 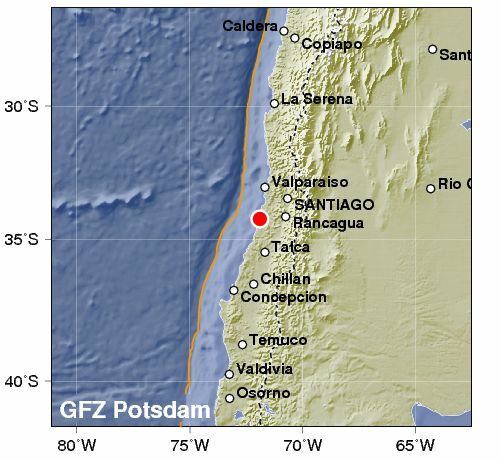 Source: USGS/EHP. Map enhanced by FIRE-EARTH Blog. The quake was preceded by a significant foreshock measuring 5.3Mw and followed by at least one sizable aftershock measuring 4.9Mw. 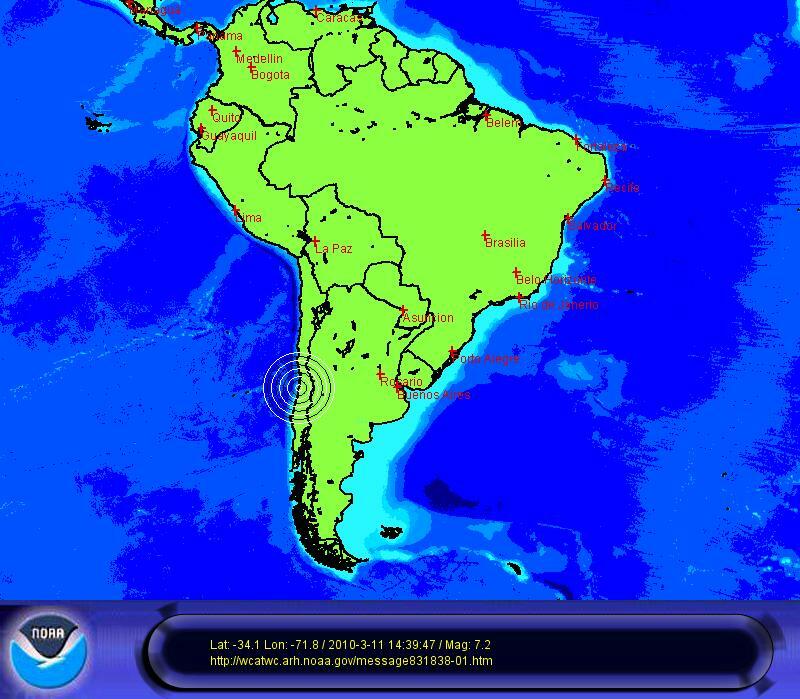 Earthquake Location Map. Source: USGS/EHP. Enhanced by FIRE-EARTH Blog. There were no local reports available, as of posting. Extreme rain events in the Andean region along the Pacific coast side of South America have affected about 5 million people, leaving at least 10 dead, and thousands of others displaced. Extreme rain events in the Andean region of Chile have triggered landslides near San Jose de Maipo causing fresh water shortages in the capital, Santiago, affecting more than 4 million people. The landslides contaminated two major rivers that supply the city’s water plants. In January, another contamination of the river Maipo left about 4 million people in the Chilean capital without water. The government has declared a state of emergency following severe flooding in the southern city of Arequipa, where tens of thousands of people were left without electricity and drinking water. Extreme weather dumped the equivalent of three months of rain in about seven hours, Peru’s meteorological service reported. “It’s a record of records. There are no records of an event of this magnitude,” the Andina news agency quoted an official as saying. Up to a 100,000 people have been affected by extreme weather. Torrential rains and flooding throughout most of Bolivia have destroyed homes, crops and infrastructure, affecting about 20,000 people. “In Madagascar, Tropical Cyclone Felleng caused the deaths of 9 people, affected 4,958 people, and displaced 1,303 people, all of whom have since returned to their homes. Furthermore, an estimated 162 houses were totally destroyed, 54 partially destroyed, and 670 houses flooded.” UN OCHA reported. In southern Malawi more than 33,000 people have been displaced due to flooding, which has left many without shelter or clothing. “Crops have been destroyed, while over 20 schools have been disrupted, affecting thousands of children.” UN OCHA reported. [February 10, 2013] Mass die-offs resulting from human impact and the planetary response to the anthropogenic assault could occur by early 2016. The epicenter of aftershock, which struck at a depth of about 20 km, was located at 36.14°S, 73.16°W. The event occurred on Tuesday, March 16, 2010 at 02:22UTCMonday, March 15, 2010 at 11:22PM at epicenter). Yesterday, another strong aftershock measuring up to 6.3Mw struck near the epicenter of today’s event. 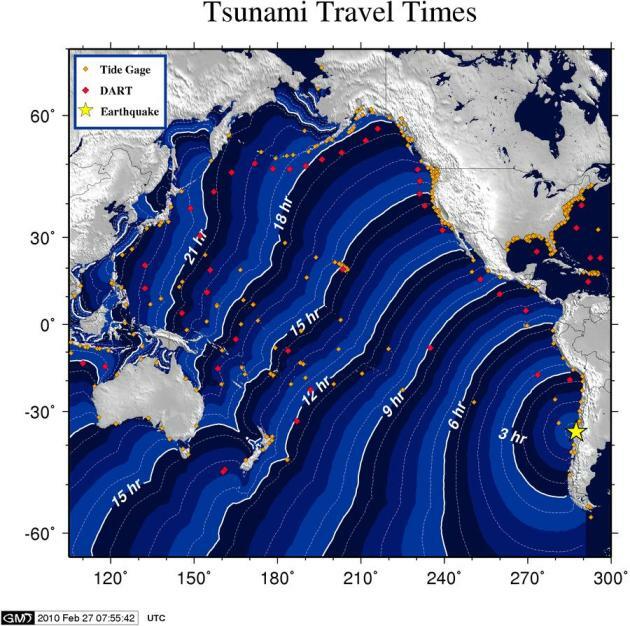 There was no threat of a significant tsunami as a result of this event. The swarm also included two strong shocks measuring 6.2Mw and 6.0Mw respectively. EQ Location Map. Click image to enlarge. Based on the earthquake magnitude and historic tsunami records, a damaging tsunami IS NOT expected along the California, Oregon, Washington, British Columbia, and Alaska coasts. At coastal locations which have experienced strong ground shaking, local tsunamis are possible due to underwater landslides. There’s goes your hopes for better times under the new management! The President-elect Sebastian Pinera is clearly a philosopher; unfortunately, he comes from the wrong school of philosophy—perhaps he would have felt more comfortable joining the Chilean military. If you landed in Concepcion by mistake, you would have been forgiven for thinking it was a war zone, with heavily armed soldiers paroling the streets, threatening to kill hungry citizens. Outgoing Chile’s president, Michelle Bachelet, has issued the victims of quake in Concepcion with an ultimatum: Chill out, or you’ll be sorry the quake didn’t bury you! To prove to the starved, traumatized and displaced that she isn’t kidding Ms. Michelle Bachelet confirmed that 14,000 troops were now operating in the region, planted in every street corner with loaded rocket launchers. According to various media reports, police (and the army) have arrested just about everyone and their uncles in Concepcion, anyone who was scouring for food and clean water, and that is a very large number indeed, in a city of an estimate 750,000 victims. As the death toll form the 8.8-magnitude quake rises above 800, search and recovery teams said at least 2 dozen others are still unaccounted for. Anyone old enough to remember the spellbinding film Missing, would also be forgiven to believe the photo below was a freeze frame from the film. Missing was an American drama directed by Costa Gavras in 1982, starring Jack Lemmon, Sissy Spacek, Melanie Mayron, John Shea and Charles Cioffi, among others. The script was based on the true story of an American journalist, Charles Horman, who went missing in the bloody aftermath of the US-backed Chilean coup that deposed President Salvador Allende on September 11, 1973. The US-backed military junta headed by the murderous head of the army General Augusto Pinochet usurped power. Pinochet allegedly ordered the murder of Allende, and ended the democratically elected Popular Unity government. Pinochet established a military dictatorship marked by severe human rights violations that repressed Chileans until 1990. Up to a quarter of a million Chileans were arrested, imprisoned and tortured by the Pinochet regime. Many thousands were murdered. Thousands more went missing. A freeze frame from the film Missing? [Original caption: Police detain people on suspicion of looting in Concepcion, Chile, on March 1.] Credit: Ricardo Pasten/AP. Image may be subject to copyright. Chileans Need Food, Water and Care; NOT Bazookas! Now they need food, water and shelter, but more importantly a caring establishment that treats them as vulnerable victims of a massive shock! What they got instead, were soldiers carrying heavy-caliber machine guns and anti-tank weapons with the muzzles pointed at them! “Go on, shoot them, put them out of their misery … what do you care? You’re only doing your job [sic. ]” Surely, so long as the copper mines continue to yield and the soldiers receive their rations, the establishment would have no worries. Chilean soldiers patrol the streets to stop looting and keep the order, as a building burns in the background after a major earthquake in Concepcion March 1, 2010. Chile’s government scrambled on Monday to provide aid to thousands of homeless people in coastal towns devastated by a massive earthquake and tsunamis, as 10,000 troops patrolled to quell looting. Credit: REUTERS/Jose Luis Saavedra. Image may be subject to copyright. The megaquake struck near the village/town of Dichato instantly destroying three quarters of the town. Then three successive tsunami waves arrived. “The first two were big and didn’t do much damage, but the last one almost wiped the village off the map,” a local resident said. “Surging waves triggered by the quake smashed houses and cars in fishing villages on the country’s long Pacific coast. In the town of Constitucion alone, 350 people are believed to have died and a public gym was turned into a makeshift morgue.” Reuters reported. Chilean government has imposed a curfew in Concepcion and the adjacent region of Maule, where the megaquake struck, after sporadic “looting” broke out. There are images of looters, of course, who are breaking into shops and warehouses, carrying white goods on their shoulders. But they are a minority. Nearly three days after the megaquake and the tsunamis struck, the majority of the local folks described as “looters” are simply desperate for basic necessities—food and water. The desperate “looters” have even raided a fire station looking for water. “The looters are more organized,” said Concepcion’s mayor, Jacqueline Van Rysselberghe, Reuters reported, asking the Bachelet government to dispatch more of those troops with [antiaircraft rocket-launchers and] intimidating helmets to reinforce “law and order” in the country’s second largest city. Caught between thirst and hunger, on the one hand, and soldiers armed with bazookas, on the other, the victims are taking their chances. Unsurprisingly, they are evolving and becoming more organized. We find it hard to term the desperate victims as “looters”; they are traumatized folks struggling for survival. Chile’s Llaima Volcano, one of the largest and most active volcanoes in South America renews activity! The Llaima volcano dribbles lava. Cherquenco town July 2, 2008. REUTERS/Ivan Alvarado. Image may be subject to copyright. See FEWW Fair Use Notice! Llaima volcano, a stratovolcano, is spewing lava, Chilean Govt said, issuing an evacuation order which imposed a 15 km exclusion zone. 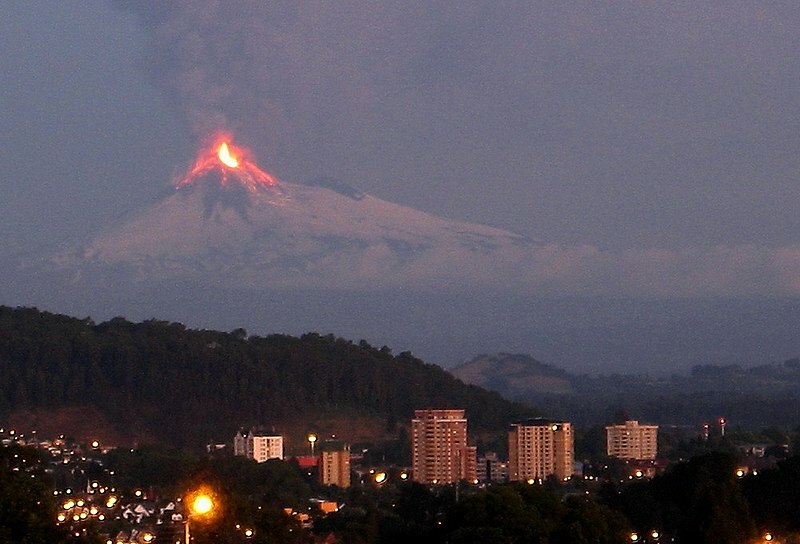 The lava, flowing towards the Calbuco River, has reached about 1 km from the crater. Llaima volcano erupted on New Year’s Day and spewed ash and smoke on february. The volcano’s last major eruption occurred in 1994. On January 1, 2008, another eruption forced hundreds of residents from nearby villages and tourists in the national parkto evacuate the are. A column of smoke reaching 3000 m high spewed above the volcano. The volcanic ash expelled by Llaima reached Argentina. It is feared that that the lava could cause an abrupt melting of snow and producing waves of lahars that could bury the nearby villages. The snow-capped Llaima’s renewed activity starts just two months after the eruption of the Chaiten volcano about 525 km further south. The top of Llaima rises about 3, 120 meters above the sea level and consists of two summits. Pichillaima, the lower summit is about 2,920 meters high. The ski center Las Araucarias lies on Llaima’s western slopes. Llaima is located about 85 km northeast of Temuco and 665 km southeast of Santiago, within the borders of Conguillío National Park, and overloks the Sierra Nevada and the Conguillío Lake. Llaima’s slopes are drained by the rivers Captrén, Quepe and Trufultruful.